Two men have been found guilty of taking part in a random attack on two students, in which one was killed. Daniel Pollen, 20, and friend Andrew Griffiths were waiting for a lift home when they were attacked in a "70 second frenzy" in Romford, east London. Daniel died from a stab wound to the heart. 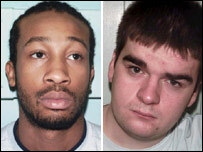 Timmy Sullivan, 19, from Barking and Michael Onokah, 25, from Ilford, were convicted of wounding with intent. Both were cleared of murder - a charge already admitted by a 17-year-old. 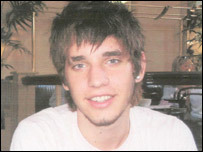 Both the victims had been out celebrating Mr Griffiths's 20th birthday on 8 July 2005. They left at 0220 BST to wait to get a lift from Mr Pollen's sister in the Brewery shopping centre in Romford, when they were attacked by the three men. Mr Griffiths, from Chigwell, Essex, was punched in the face and head and was stabbed. Mr Pollen, from Buckhurst Hill, Essex, had his jaw broken and was stabbed in the heart - he never regained consciousness. 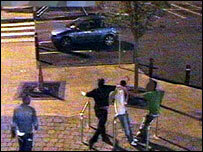 Even after a three-week trial, it was not clear why they were attacked, said Det Ch Insp Dave Brown. Mr Griffiths, a medical student at Durham University, described the attack as a "70-second frenzy". "At the time of the attack, Dan and I were just sitting, chatting and laughing remembering our holiday and talking about my 20th birthday celebrations," he said. "We had just enjoyed a night out in Romford with our friends and were waiting for a lift home from Dan's sister when we were attacked. "Seconds later Dan was dead. I still can't believe it." Sullivan and Onokah, both painters and decorators, were cleared of murder but convicted of wounding with intent and causing grievous bodily harm. A 17-year-old youth from Stratford, who was 16 at the time of the attack, has already pleaded guilty to murder and grievous bodily harm with intent. All three are due to be sentenced on 23 June.